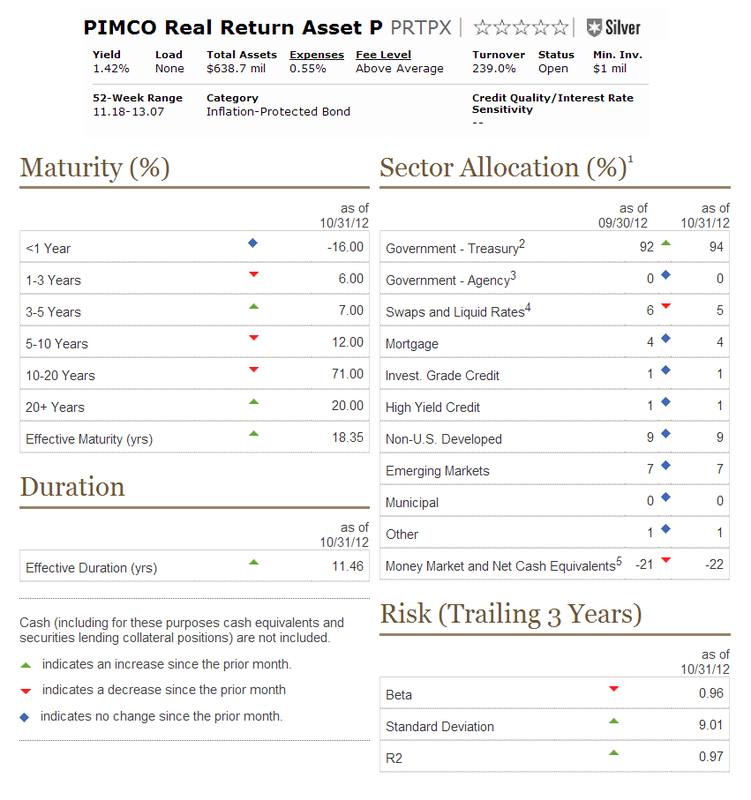 PIMCO Real Return Asset fund objective is to provide maximum real return with prudent investment management. It utilizes its assets to purchase a portfolio of inflation-indexed bonds of varying maturities issued by the U.S. and non-U.S. governments. Since December 2007, Mihir Worah has been the lead fund manager. He started managing the Institutional Class first in 2007 and later the P Class was introduced in November 2010. It has low annual expense ratio of 0.55%. It also has 1.36% 12-month dividend yield. The CUSIP is 72201W816. There are 26 brokerages offered this fund, such as JP Morgan, Ameriprise Brokerage, Scottrade TF, TD Ameritrade Retail, LPL SAM Eligible, etc. 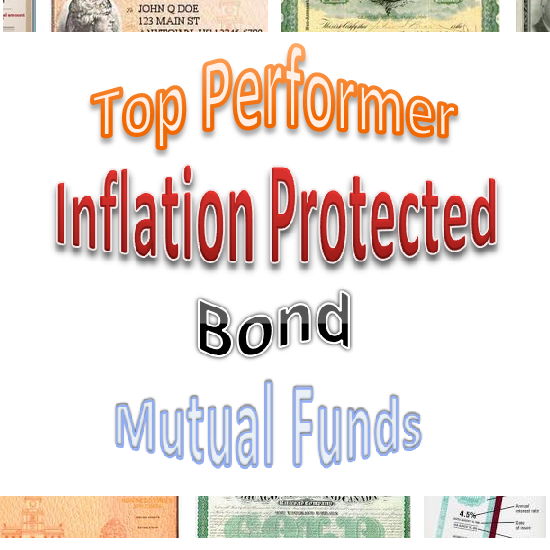 You can buy this best performing inflation protected bond mutual fund with minimum investment of $1 million. The sector allocations as of October 2012 are 94% in government treasury, 9% in non-US developed, 7% in emerging markets, 5% in swap and liquid rates, 4% in mortgage, 1% in each investment grade credit; high yield credit and others as well as -22% in money market and net cash equivalents. The GMO Inflation Indexed Plus Bond fund invests majority of assets in its index benchmark and in global interest rate, currency and credit markets. The fund’s NAV is $15.81 as of December 10, 2012. Since its inception in 2006, Thomas F. Cooper has been managing this fund. The total net assets are rather small with only $51.79 million. It has 3.49% yield. The most recent dividend distribution was in July 2012 ($0.12). It also has yearly expense ratio of 0.39%. The annual holdings turnover as of November 23, 2012 is 69.00%. This best performing inflation protected bond mutual fund has returned 13.93% over the past year and 14.35% over the past 3 years. It gets 4-stars rating from Morningstar. The best 1-year total return so far was 30.25% (in 2009) and the only year it has negative return was in 2008 with -24.77%. It also has 7.76% of 5-year annualized return. Currently this fund is only available for purchase through DailyAccess Corporation RTC. The investment aim of Lord Abbett Inflation Focused fund is to provide investment returns that exceed the rate of inflation in the U.S. economy over a full economic cycle. This top performer inflation protected bond fund is managed by an investment team leads by Robert A. Lee, Kewjin Yuoh, Andrew H. O’Brien and Jerald M. Lanzotti. Since this taxable bond fund is new, it has no rating from Morningstar yet. It shares a yield of 3.81% and has just distributed $0.04 dividend to its investors in October 2012. The total net assets are $451.32 million. This Lord Abbett fund has 0.78% expense ratio rate. The year-to-date return is 9.45%. Investors will need $1,500 minimum initial investment for either brokerage or retirement account. There are 34 brokerages that provide the sale of this fund. It charges 0.20% management fee and 2.25% front-end sales load fee. The share price is $14.99. 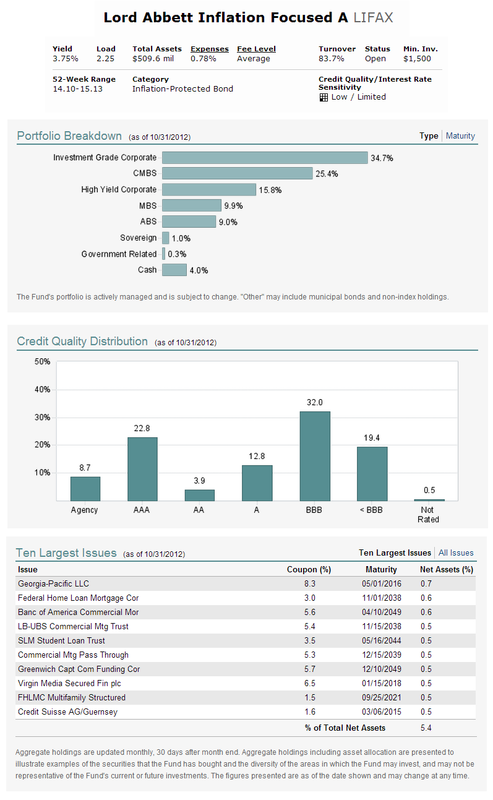 As of October 2012, the top portfolio breakdown is 34.7% in investment grade corporate, 25.4% in CMBS and 15.8% in high yield corporate. The largest issues are Georgia-Pacific LLC (0.7%), Federal Home Loan Mortgage Cor (0.6%), Banc of America Commercial Mor (0.6%), LB-UBS Commercial Marketing Trust (0.5%) and SLM Student Loan Trust (0.5%). 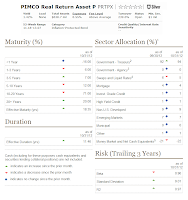 As part of PIMCO fund, the PIMCO Real Return fund has total net assets of $25.49 billion. The annual expense ratio rate is 0.85%. Its annual holdings turnover is 129% as per November 25, 2012. It has 3-stars and Gold rating from Morningstar. The fund manager is Mihir Korah since December 2007. The performance of this top performer fund is quite good with 12 years of positive return since inception and 2 years of negative return. The best 1-year total return was in 2009 with 18.43%. It has 8.69% YTD return. Based on the load adjusted returns, the fund has returned 7.85% over the past 3-year and 6.65% over the past decade. The sector allocations are 89% in government-treasury, 8% in non-US developed, 6% in emerging markets, 2% in each mortgage and investment grade credit, 1% in each high yield credit and other, -2% in swaps and liquid rates as well as -7% in money market and net cash equivalents. 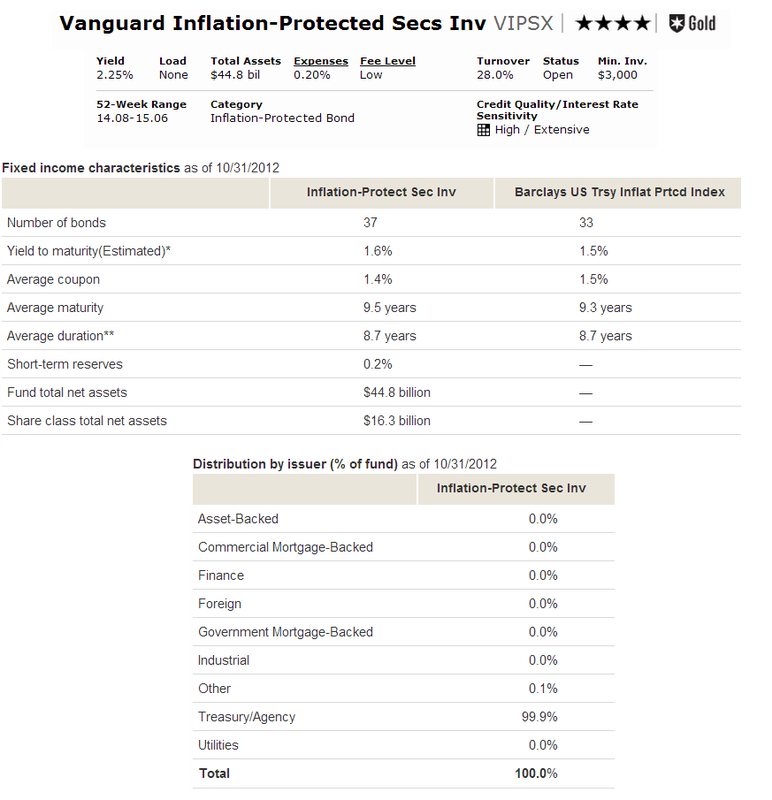 This Vanguard Inflation-Protected Securities fund focuses its assets in inflation-indexed securities. It invests in inflation-indexed bonds issued by the U.S. government and corporations. The fund’s expense ratio is 0.20% per year which is 75% lower than the average expense ratio of funds with similar holdings. 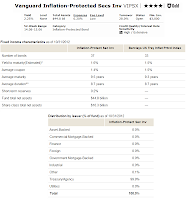 Morningstar give 4 stars and Gold rating for this Vanguard fund. It has 6.88% year-to-date return. It also has $44.80 billion of total net assets. The investors have just got their quarterly dividend in September 2012 with $0.06, which is part of the annual dividend of 2.26%. Gemma Wright-Casparius is the current fund manager. 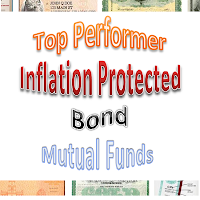 This inflation protected bond mutual fund has returned 7.55% over the past year and 7.50% over the past five years. The best return so far was achieved in 2002 with 16.62% while the only worst year since inception was in 2008 with -2.85%. The benchmark of this fund is Barclays US Treasury Inflation Protected Index. It has 9.5 years of average maturity and 8.7 years of average duration. The primary risks for investing in this Vanguard fund are income fluctuations risk, interest rate risk and manager risk.